September 2nd, 0845h: Andrew Lysser, pilot, aerial photographer, instructor, and owner of Cumbria Gyroplanes, and I lifted off from the runway at Carlisle airport in a silver-coloured gyroplane. This time I wasn’t nervous, and there was no wall of rain advancing towards the Firth. 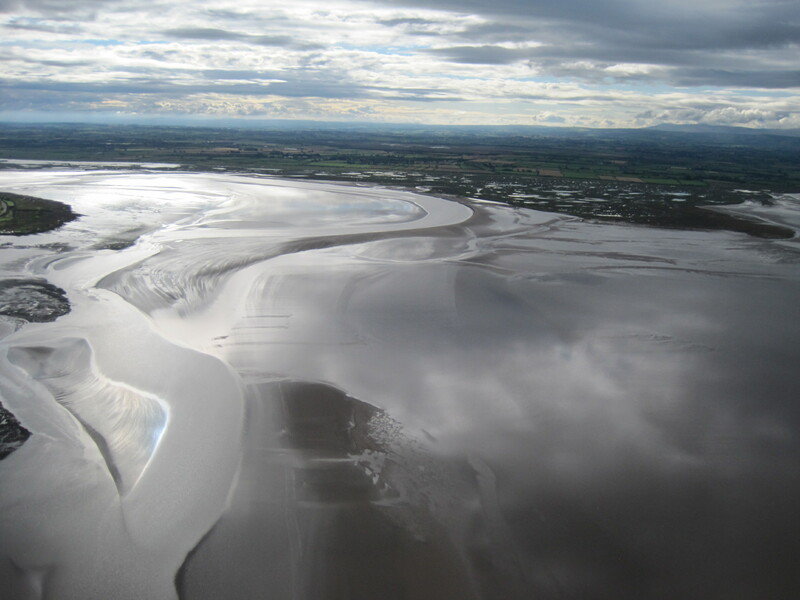 It was a perfect morning for our second attempt to fly along the English coast of the Upper Solway Firth. Quiet, bright weather. Scattered clouds, and a slanting light painting water and sand in shades of satin-silver and grey. 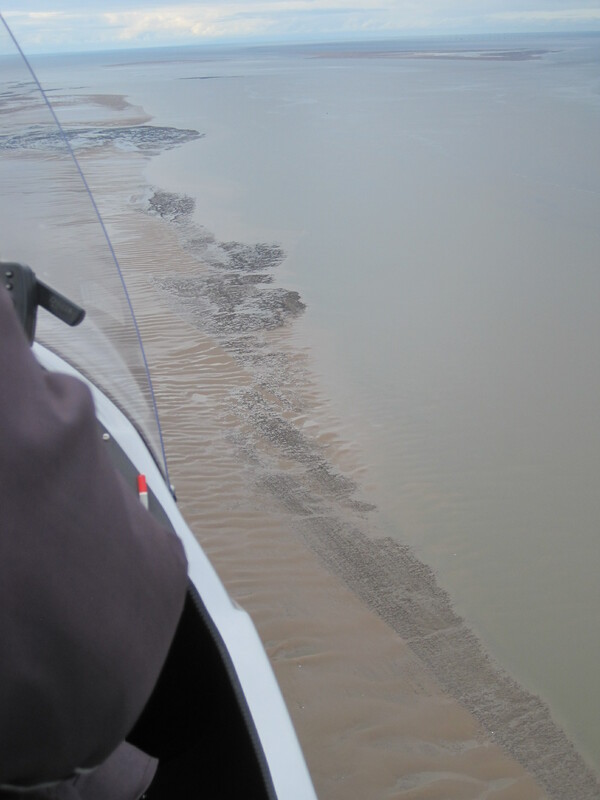 And moreover – the whole point of this flight – an Extreme Low Water Spring (ELWS) tide. The retreating sea would reveal the rocky scaurs, the sandbanks and shoals, and the morning light would pick out the patterns of sand and rocks on the shores, would show the run-offs, the saltmarsh creeks, the channels of the rivers and of the Firth itself: a snapshot of a moment in time, of the design that influences the function of the Solway. 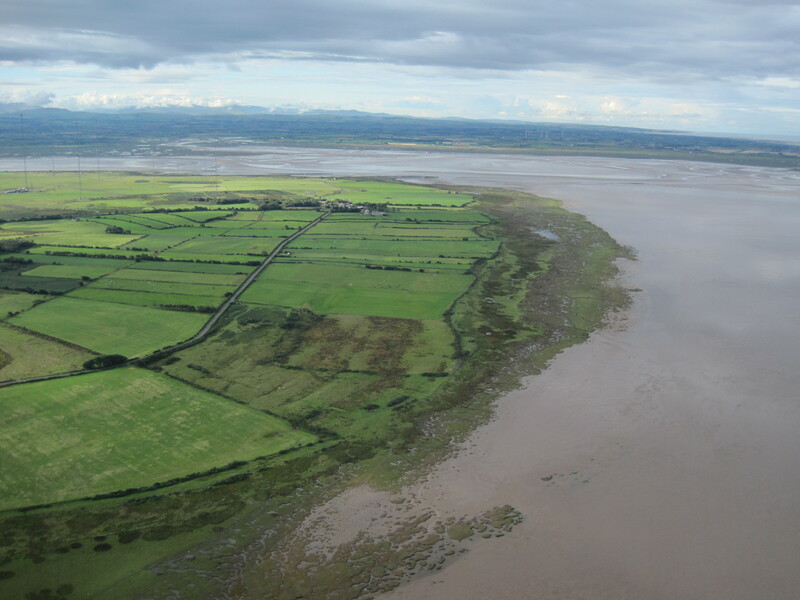 On our first attempt we had reached Bowness-on-Solway and the stubby remains of the Bowness-Annan viaduct before the weather forced us to turn back, so now our attention was focussed on ‘the island’ (actually, a bulging peninsula) with the masts of Anthorn, and beyond. 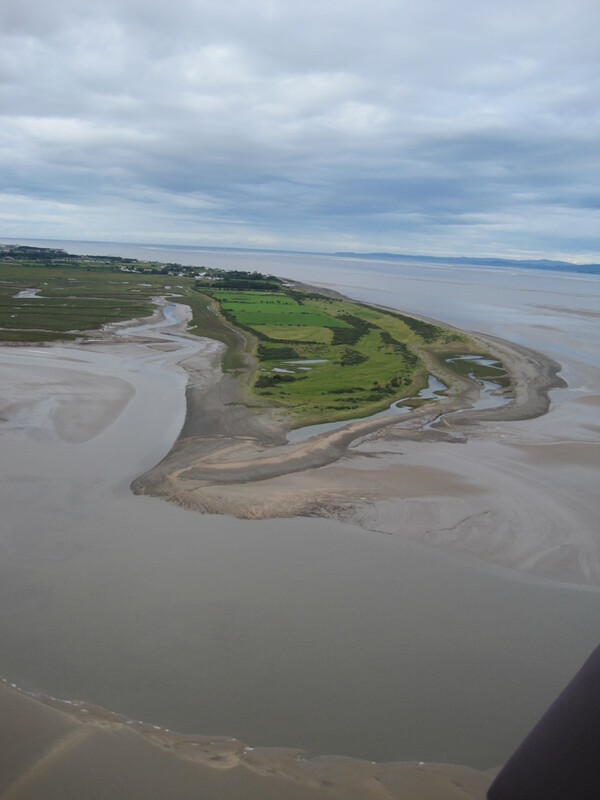 ELWS also means extreme high water at the other end of the tidal cycle, and the saltmarshes were still holding large pools of water, the creeks were full. 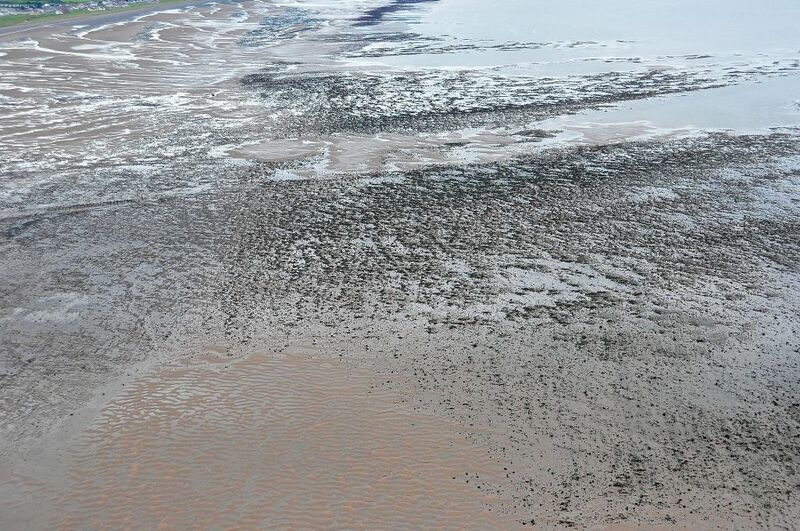 We circled over the mud and sand of shallow Moricambe Bay; a piece of the fuselage of a WW2 Hudson bomber – hence the Bay’s other, grim, name of Hudson Bay – protruded sufficiently from its grave to provide a perch for a gull, and cormorants posed nearby on the posts of long-gone stakenets. 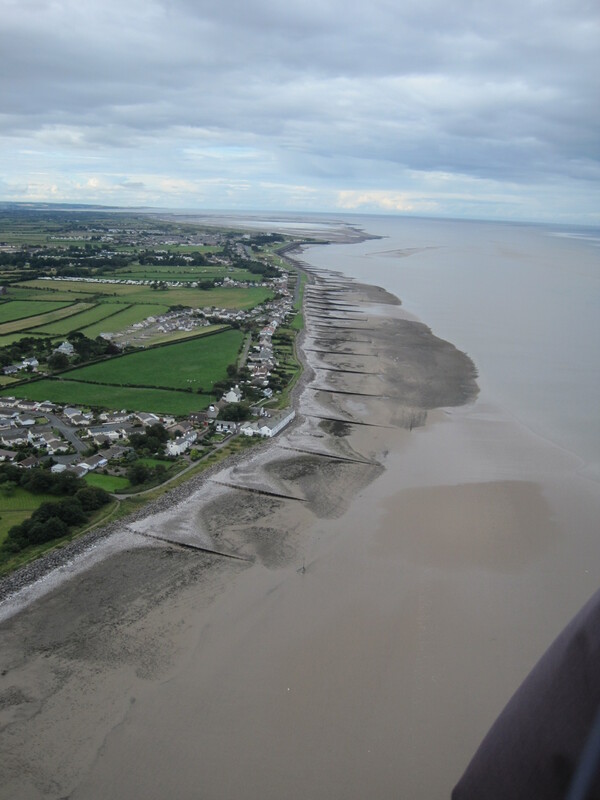 Then we turned South again, over Grune Point, part of the AONB, where mudflats – teeming with burrowing crustacea and bivalves – attract wading birds. Rocky scars extend far into the channel; the outermost dark patch is Outer Ellison’s scar. 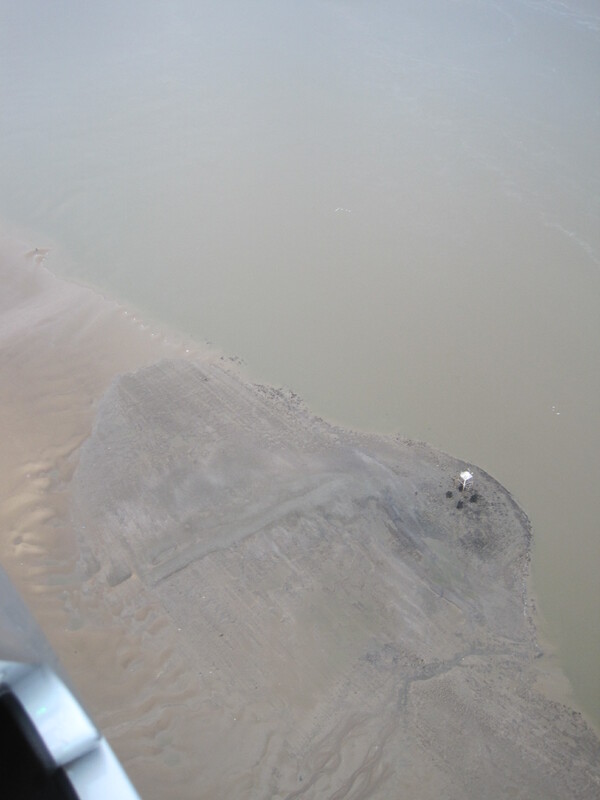 South of Silloth, rocky scars had been uncovered and the ‘Tommy-Legs’ lighthouse is stranded like a triffid on the sands. Already a striking pattern is emerging, of broad, long-wavelength sand-ripples – sand-waves or megaripples; and along the exposed edge of the sloping shore, strips and patches of rock and stone. More surprisingly, the rocks are arranged in dark ribbons at a steep angle to the shore-line, and even more surprising, sometimes normal to the direction of the megaripples. 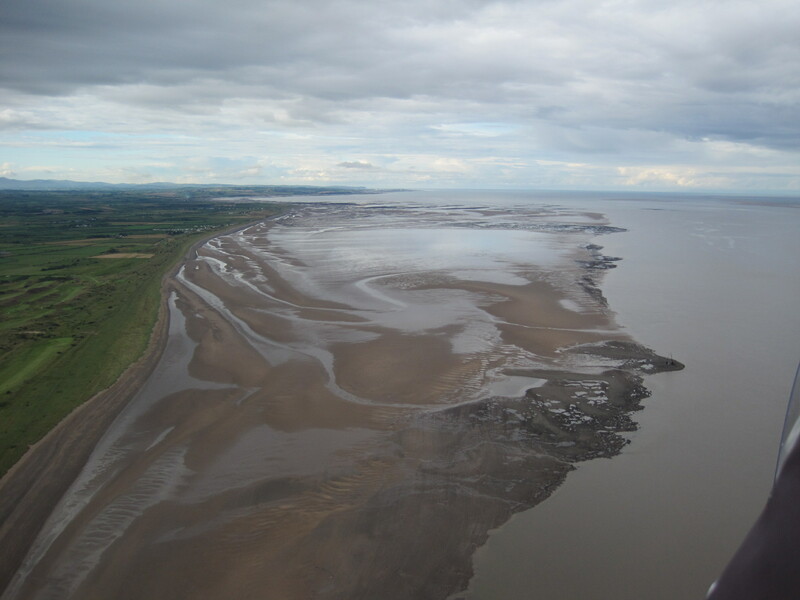 But even at about 500 feet, we’re too high to discern the orientation of the small sand-ripples that the megaripples will carry on their backs, and which will affect the extent to which sediment is lifted and carried by the waves. 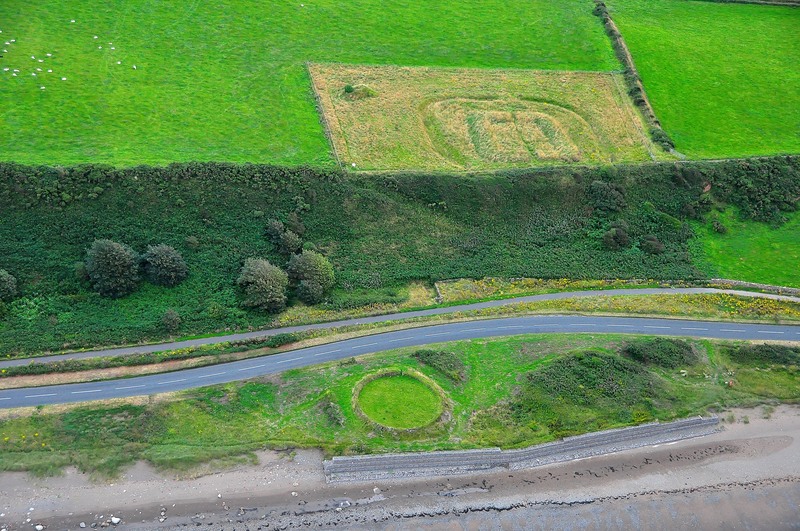 I know that on the ground the scaurs are made up of small- to medium-sized pebbles and rocks with no distinct orientation: yet, seen from above, it’s clear that the direction of tidal flow has a strong influence on their design. 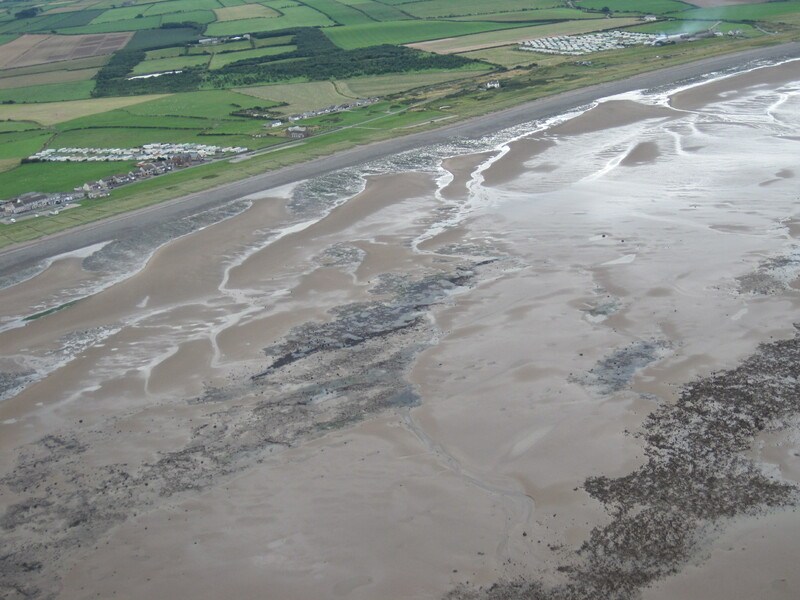 This in turn must surely have an effect on the biology of the shore, the places where animals and algae are deposited or can actively find shelter. Off Mawbray Banks we circle to have a closer look at the lines, rectangles and triangles of stones on the lower shore. 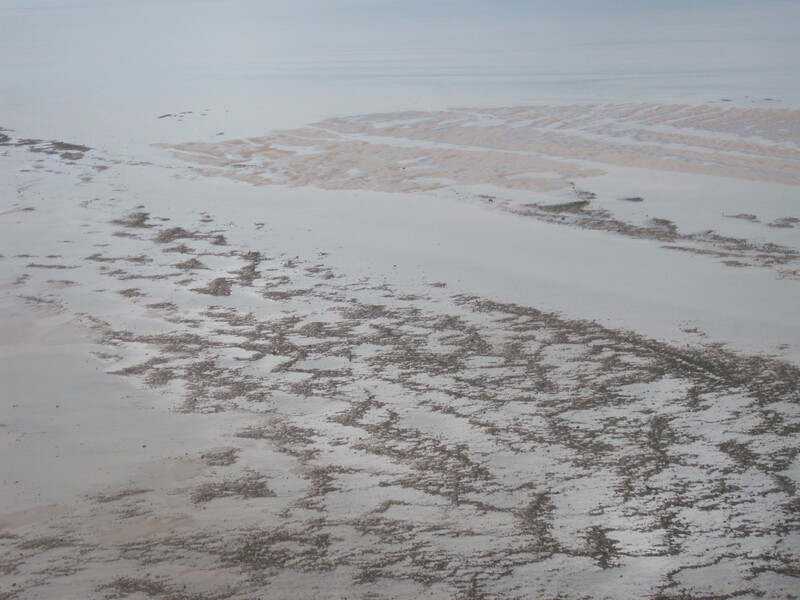 From the air, it seems even more likely that they are the remnants of fish-traps (see this blog-post for the aerial photos). Were there also wooden stakes and nets, or are the stones merely the walls of retaining pools? Andrew suggests I take a spade and dig near the stones to see if fragments of wooden stumps remain. It has been worth the wait for this exceptional low tide. From above Dubmill Point the view in all directions is breath-taking. 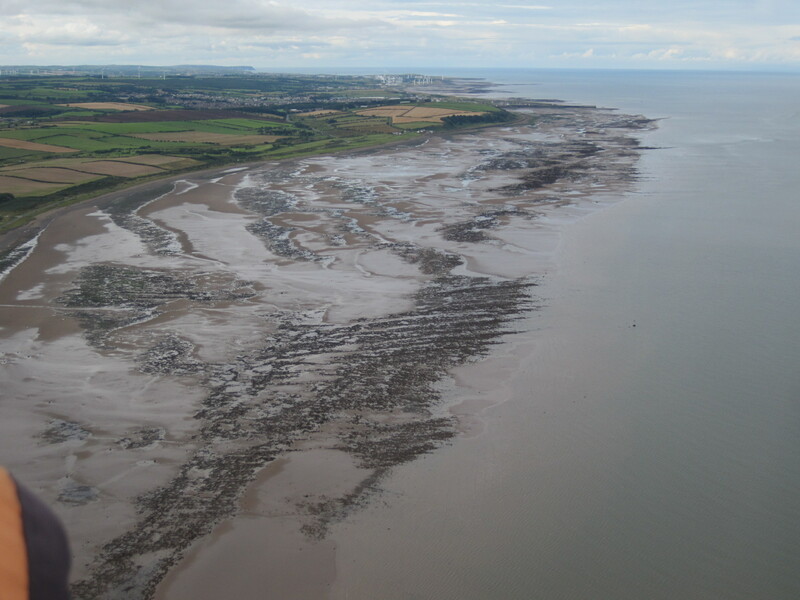 The reefs and sculpted mounds of the honeycomb worm, Sabellaria, are special to Allonby Bay, and one of the reasons why it has been proposed as a Marine Conservation Zone. The reefs retain the outgoing tide and thus change the distribution of animals and algae on the shore – so it’s interesting to see that the Sabellaria areas appear in some areas as almost-square ‘cells’ of trapped water. This isn’t apparent when you are at reef-level on the shore. 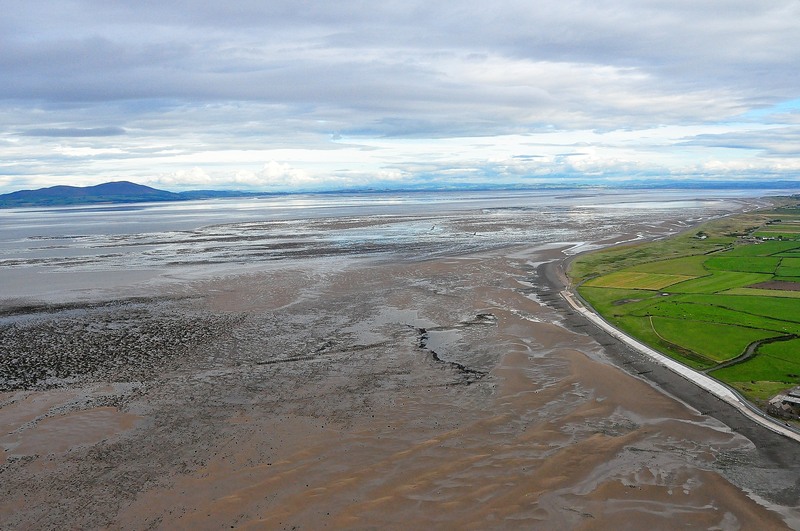 On evening back in April I walked along the Allonby shore with Ronnie Porter so that he could tell me about ‘the naming of stones’ – the old names for scaurs and boulders, that identify where one might put out herring nets or gather shrimps or prawns. It was difficult to understand the overall topography from shore-level, so to ‘see the bigger picture’ was another purpose of this flight. This was much harder than expected, and it proved impossible to identify single marker stones other than Maston up on the mid-shore; but it was astonishing to see how far out the scaurs stretched, to see the often hard-to-reach Hill and Far Hill exposed. What a wealth of marine animals and algae would be out there! Quite often, on a rough and windy day when the tide is flowing back up the Firth, a shifting white line of breakers is visible way out in the channel to the West. 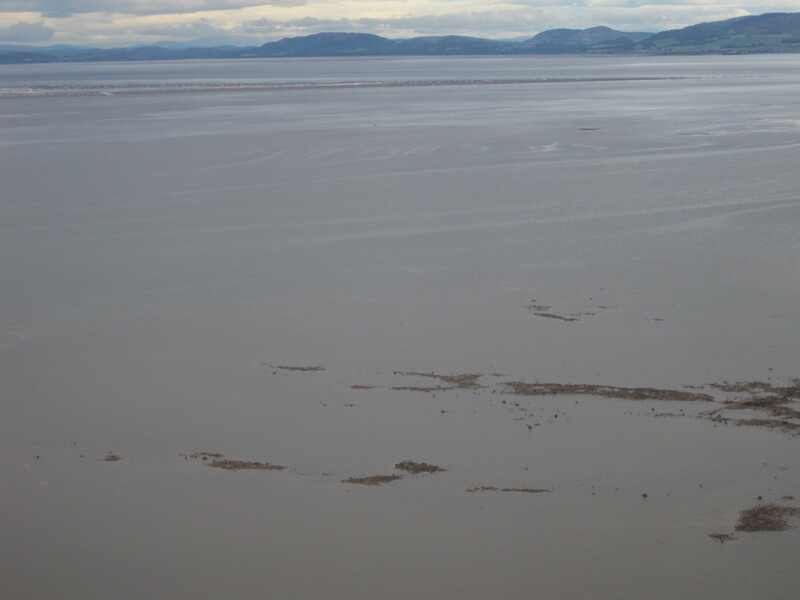 Today, it was obvious why: large sandbanks were exposed in the middle of the Firth, upon which waves would shoal. This was also a graphic explanation of why ships heading for the Port of Silloth are required to take on a pilot at Workington. 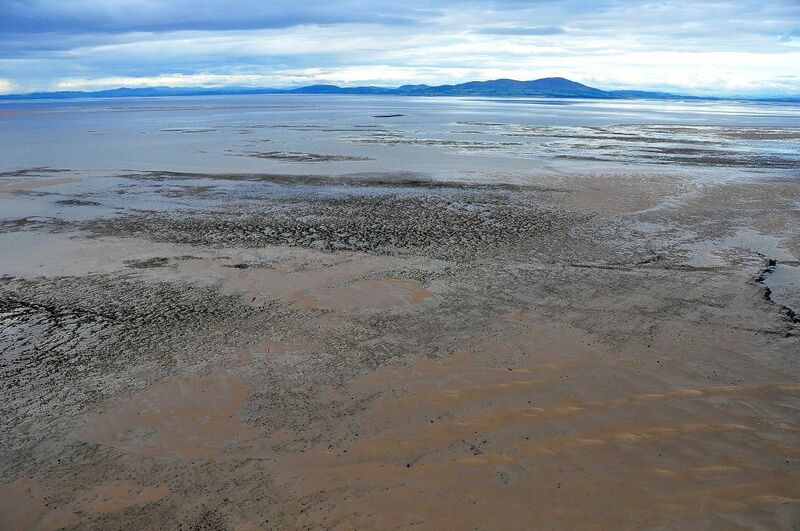 Crosscannonby at the south end of Allonby Bay was to be our turning point, where we had a seagull’s eye view of the saltpans and Roman Milefortlet 21 (for more on the Solway saltpans see ‘Angels, salt and shroud-pins‘). Above Silloth once again, we could see far into the distance, where there would once have been a large freshwater lake, formed from melting glaciers. Below us, about 10000 years ago, a forest, subsequently replaced by sphagnum bogs, would have spread across the low-lying land between ‘England’ and ‘Scotland’. Now we could see how the encroaching sea and the outflowing rivers had eroded and sculpted the former plain; they are doing it still. 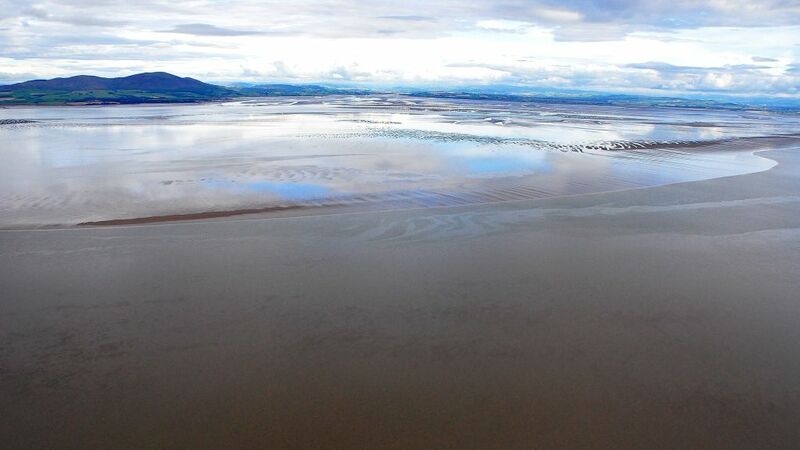 Beyond Silloth the broad shallow estuary of Moricambe Bay glittered; beyond Anthorn and Bowness, a narrow silvery line shone light on the contest between the tides and the rivers Esk and Eden. 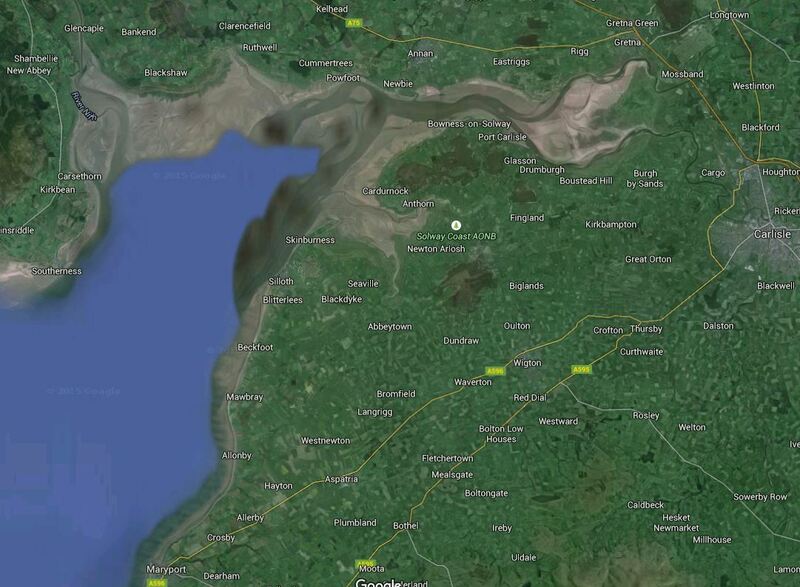 Closer, it was obvious, too, why pilots must enter Silloth’s New Dock at an angle. And across the Firth the tide had drained away into the Irish Sea leaving behind, for a few hours, the story – in ripples and sand-waves and shoals – of last night’s waves and wind and currents. 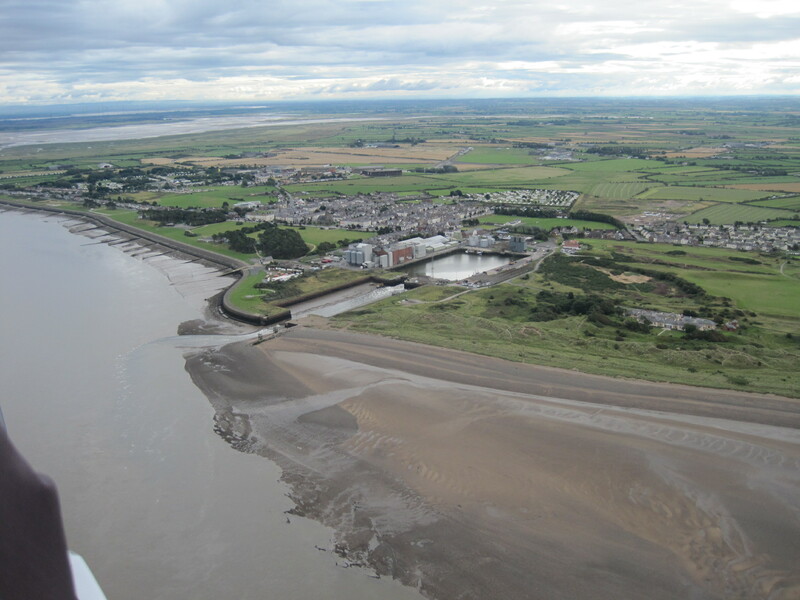 This entry was posted in aerial views, Allonby, ports, sand, sea-bed & undersea and tagged aerial views, gyroplane, megaripples, ripples, River Eden, Romans, Sabellaria, salt-pans, sandbanks, ships, Silloth, Solway. Bookmark the permalink.